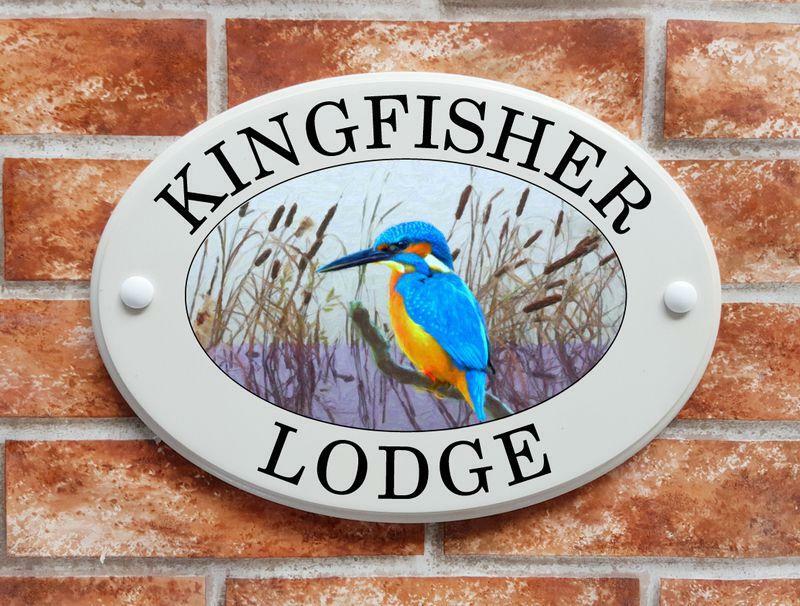 Not to be confused with our hand painted pictorial signs, this range of house plaques are printed with the latest UV resin ink printing tecnology. 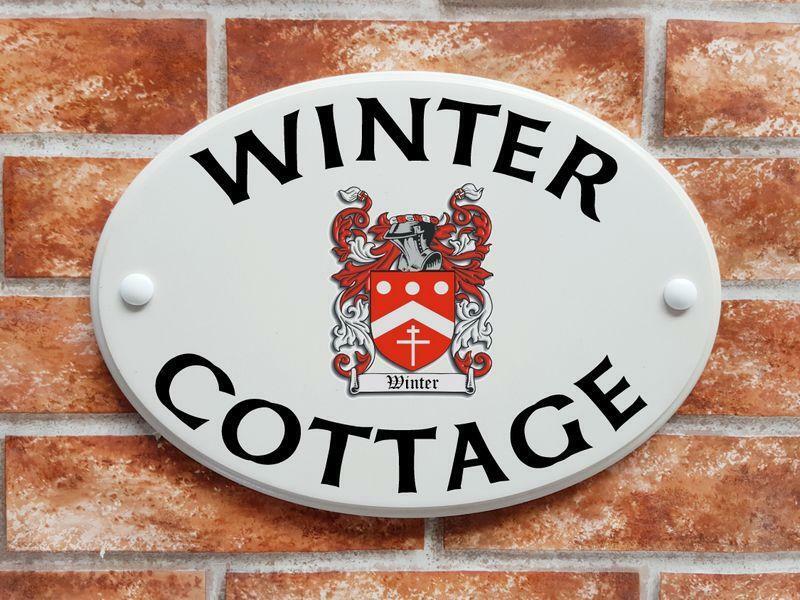 With this state of the art printing method we can produce highly detailed weather proof decorative house signs ideal for outdoor (or indoor) home signage. The oval base plaque is hand cast in white cultured marble which is also completely weatherproof. 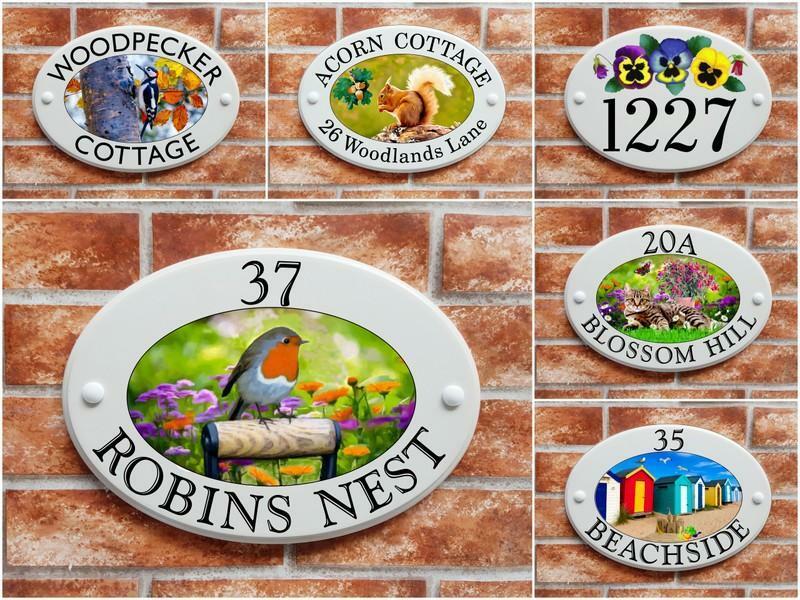 We offer a choice of several colourful, weatherproof digital prints with a combination of your house name, house number or street address. The cultured marble has a creamy off white appearance and the black text can be personalised to your own requirements with a choice of 7 fonts and several different text layout options. 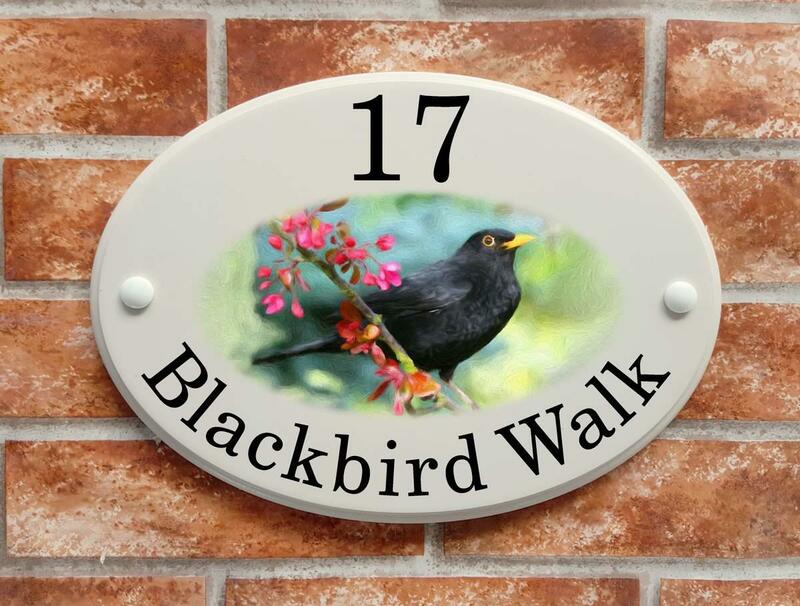 We print your house name, address or house number directly onto the plaque with a choice of reproduced pictorial art created by our in house sign artists. The prints are permanent, durable and even scratch proof and will give many years of service outdoors in all climates. 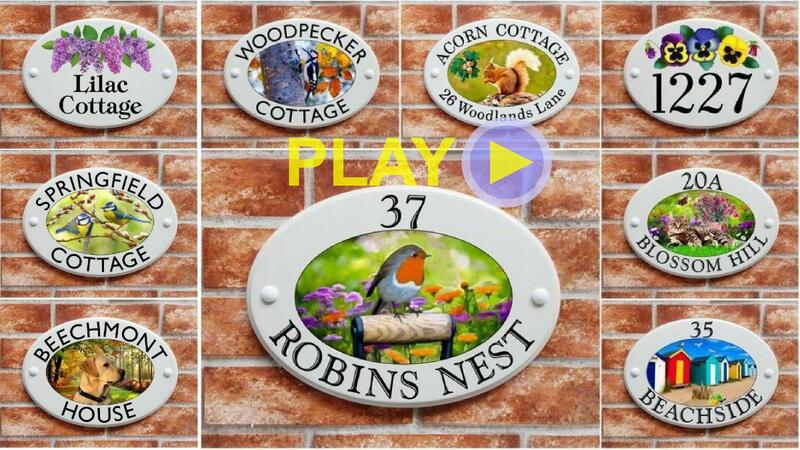 All pictorials have been created by our chief house sign artist who paints the original artwork to an A3 size canvas. Once the pictorial is complete we can scan his work of art and then digitally scale down and edit the pictorial to fit within the oval center shape of the base plaque. The result is a pretty life like reproduction of his original pictorial together with your house name or address in black lettering. 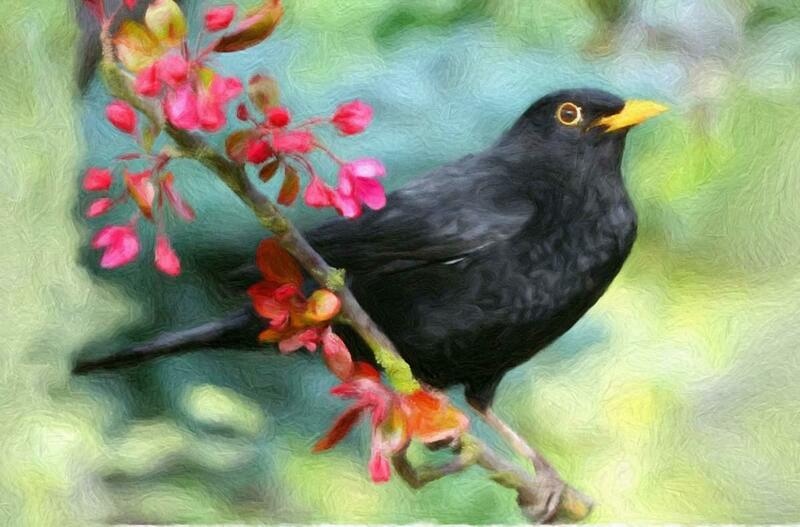 These printed images are copies of the original artwork and we own the copyright. 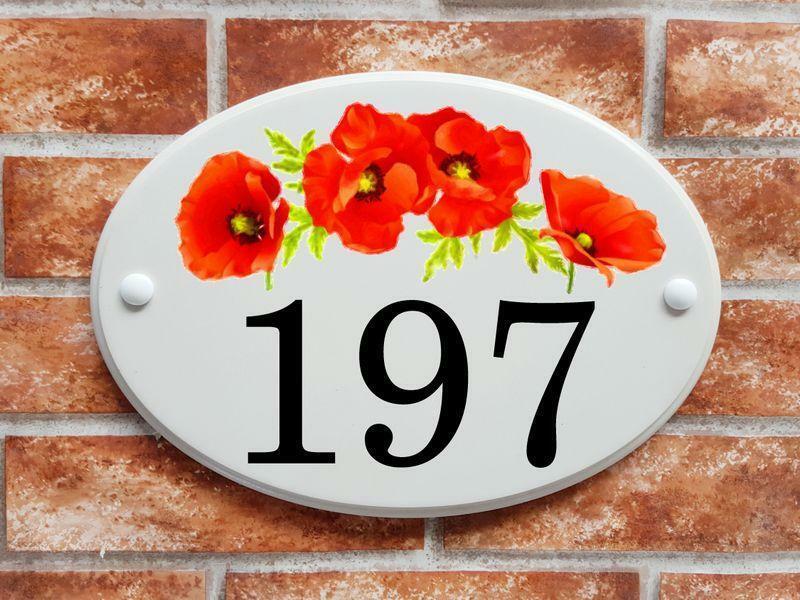 The original picture is scanned and then digitally scaled to to size to fit within the oval center of the plaque with room for the house name or address arching along the top and bottom of the sign. 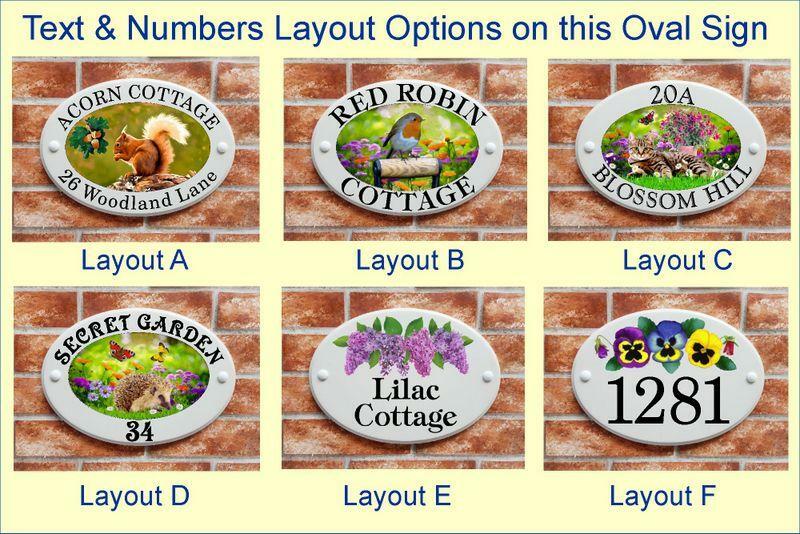 Our sign artists are busy creating many more original pictures to expand this range of decorative house name and number plaques. 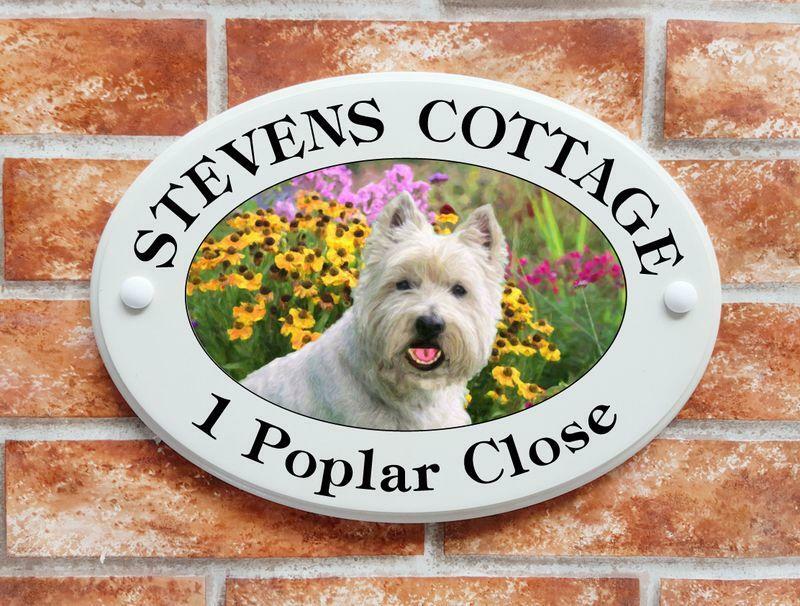 Currently we can offer this house sign with the top 10 UK dog breeds, popular animals and bird themes and some floral designs. 1. 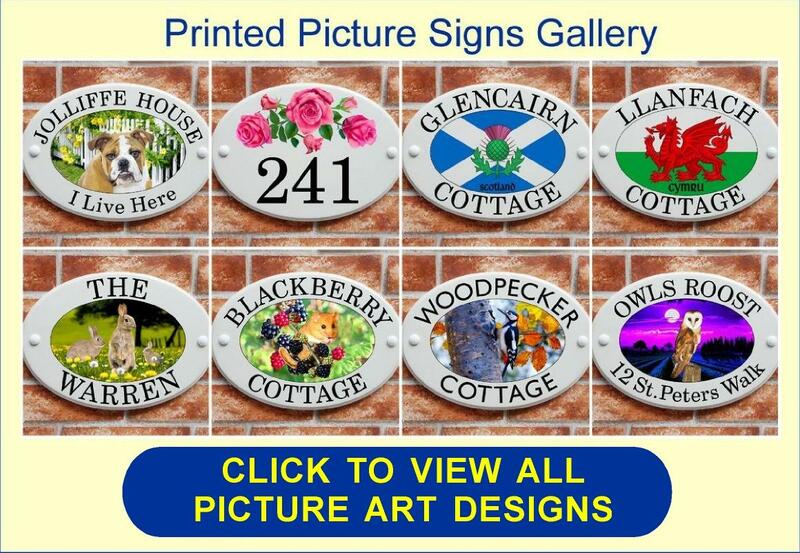 Simply select the printed picture you would like from the selection in our Picture Signs Gallery and make a note of the code number. 2. Take a look at the layout options below to choose your desired layout and make a note of the letter code. 3. Choose a font. We normally recommend all capital letters for arched wording particularly for the wording across the top of the plaque. Capital and lowercase letters are also possible but please note that if your required wording has any lowercase descenders (g,j,p,q,y), this will reduced the size of the letters slightly. 4. Then simply place your order on the product page by using the drop down menus. 5. 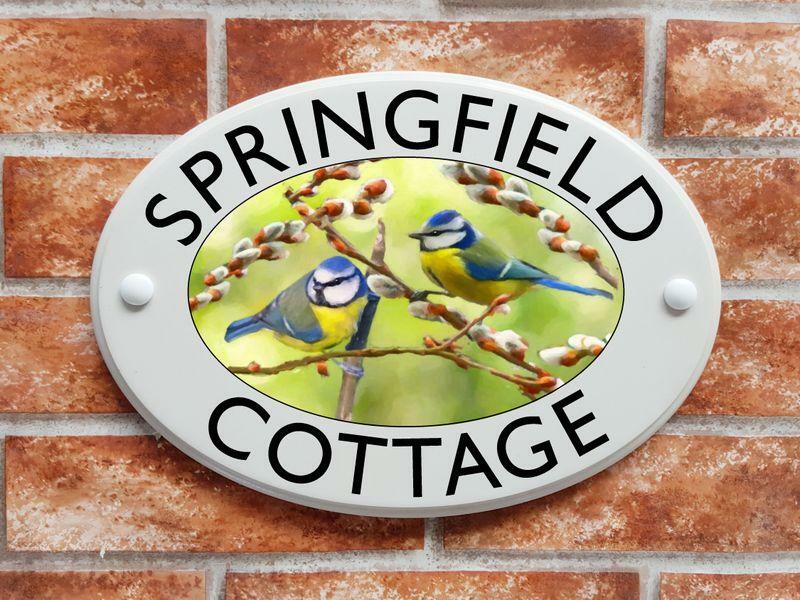 After receiving your order, we will send you a proof of your house sign for you to approve. 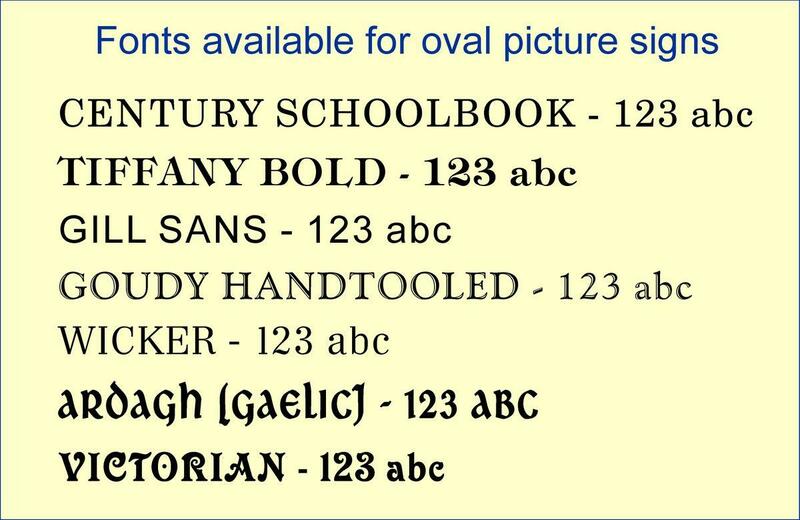 If you do not like the font you have chosen, we will provide another proof in a different font. 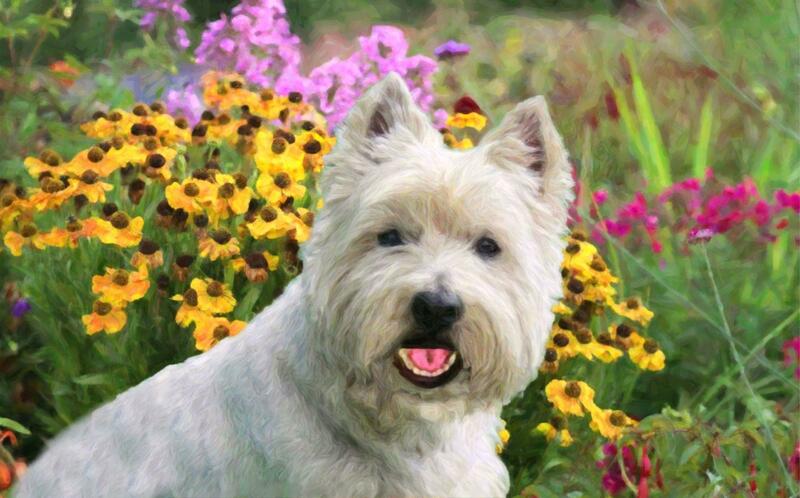 Want to order one as a gift but not sure which picture or wording to choose for the recipient? Why not order one of our Personalised Carte Blanche Gift Certificates and let your recipient choose what they would like.